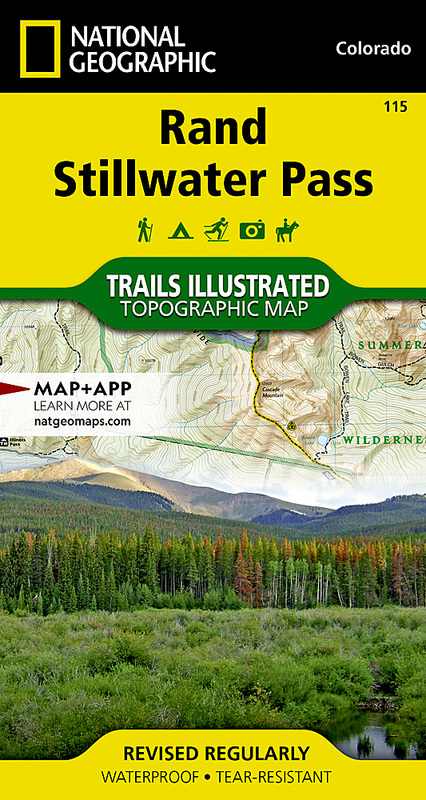 National Geographic's Trails Illustrated map of Rand and Stillwater Pass was designed for outdoor enthusiasts exploring this pristine mountainous area just outside of Rocky Mountain National Park. Expertly researched and created in cooperation with the U.S. Forest Service, Bureau of Land Management and others, the map provides unmatched detail of many popular recreational points of interest in and around Routt and Arapaho National Forests. Coverage includes Never Summer Wilderness, Seymour and Arapaho Lakes, Rabbit Ears Range, Bowen Gulch Protection Area and Arapaho Ridge as well as part of the Continental Divide. Follow mapped trails, Forest Service roads and BLM routes as you adventure into this region of few amenities. Trails are marked according to their designated usage, whether hiking, biking, ATVing, snowmobiling or cross-country skiing, including a section of the Continental Divide Trail. To aid in your navigation, the map includes contour lines, elevations, labeled peaks and summits, water features, areas of wooded cover, selected waypoints and clear color-coded for national forests, wilderness areas and state parks. Other recreation features pinpointed area campgrounds, picnic areas, trailheads, wildlife viewing areas and fishing holes. Also listed are Leave No Trace Guidelines, wilderness regulations, safety tips and essential contact information. Other features found on this map include: Arapaho National Forest, Never Summer Wilderness, Owl Mountain, Parkview Mountain, Rabbit Ears Range, Routt National Forest.